Hmmm… parallel universes? Does this mean we could meet a “Mirror Universe” jefbot (with an evil goatee and monotone voice, of course) or any other Mirror BOTiverse characters in future installments? Let’s hope so! Sorry for the late comic – the more time-consuming art style of the latest strips and being swamped with some stuff I’ll share with you shortly are to blame. With some luck I’ll be able to get Friday’s JEFbot up at a decent hour. [UPDATE 10/14/2013] Buh. Apologies for Friday’s missing JEFbot! Once again, life stuff intervened and I wasn’t able to get the latest JEFbot out. I was able to work on the strip this weekend, though, and I’ll be spending today making sure we’re back on track tomorrow (Tuesday) with a new strip and then (hopefully) there won’t be any further delays. Thanks – as always – for your patience! heheh. well if you ever make it back to your original universe, send me a postcard or something! nice! i won’t feel nervous about breaking your streak if i post late then! heheh. awww… thanks! and i’m happy you’re enjoying the artwork since, even though the current style is more time-consuming, i’ve been having a blast doing it! Wow I’m impressed!!!!! The colors and shapes! Multiple universe theory huh? Always an interesting topic. I wonder if we’ll ever see a character from another universe? That is, if we haven’t already! i’ve always loved the idea of multiple universes, GB! and, chances are good that we’ll meet someone from a different one (yes, if we haven’t met one already!) heheh. I just now remembered the rabbit at the very start of this “trip”. Has he managed to stumble in from another universe? Wow, what are you smoking? (j/k) I’d bet that the Cornfather will be skinny in the alternate universe like he is IRL, and his hat worn the other way. Loved the art in the last two strip’s, very beautiful. Could it be?! Are you building up to an epic summer webcomic event? Crisis on Infinite ‘bots?! Sidebar: food for thought: if you start, say, traversing the Multiverse, is there a chance of a series of “comics” consisting of photographs for “our” universe? She DID recognize Musashi, so you may be on to something. Or she’s been charged with recruiting him, so to speak. impressed you remembered that little detail from soooooooo long ago, E. A. Setser! Anomalies stick with me. I guess it’s a writer thing. Ahh, now you’re reminding me of The Walls of the Universe and The Broken Universe (two trippy Multiverse-spanning novels by Paul Melko). You know those split second blackout moments? It’s like, you’ll be in the middle of doing something, then just sort of blink out of consciousness, and for a moment, you have zero concept of how much time passed and feel completely out of place. I’ve started chalking it up to time travel or alternate universes. As though I — to my perspective — abruptly had some knowledge “planted” in my mind. hmmm… i can’t recall any “blackout” moments like that (well, without the presence of vast quantities of alcohol) but from your description, it definitely sounds like you have some time travel/alt universe shenanigans going on, E. A.! if you suddenly disappear, we’ll know what happened. I’m not even sure how to describe it, but I always figured it happened to everyone. It’s similar to zoning out and coming out of it, except it’s all condensed into a split second. If I start remembering things that didn’t happen anymore, I’ll be sure to call J. J. Abrams. hmm. i’ll try and keep aware of it if it happens to me, E. A..
Haha. Did you know that in one of the holy book, REDACTED, REDACTED, once said that there are 7 person in the world who actually looks like you. i’ve heard that, Jf#300, and i used to get people telling me all the time that i looked exactly like someone they knew. i’ve never actually met any of these dopplegangers, though. would like to. What if cel is just an alternate jefbot and vice versa. I sort of dont want this to be true, but at the same time it would be cool, but it could cause a paradox or something if they get together. Would this mean their relationship is forbidden by the entire universe?! Well now I have another thing to wonder about during night. (Not that Twilight is as bad as people say it is, but Bella got herself into such a deeper mess compared to cel. “relationship forbidden by the entire universe” – that’s a lot of pressure and guilt, DAS! let’s hope for bot’s sake it doesn’t come to that. But if they’re alternate dimensional counterparts, wouldn’t there have been a cataclysmic cosmic event when they first met/touched? …no, wait. Sorry. I’m thinking of time travel (and according to Doctor Who, only sometimes). If you watched Futurama: Bender’s Big Score, time travel is still an alternative theory. …I am so vastly behind on so many things I need, like, a month of vacation time and absolutely nothing to do in order to get caught up. And even then it’s not a guarantee. same here, JOE. except i feel i’d need like, 4 months of solid watching and playing before i could even begin getting caught up. Ouch. You’ve hurt my brain. I had that exact same thought :D, Jefbot and Cel ( Bots have cells? correlation anyone? ) But both deal with tech, and if it IS an alternate universe where genders are switched, then that could make sense. Also, if I am thinking stright, when cel left, she said: “Jefbot…. I have to leave now” Which could imply two things ( especially since he never found her ) that she actually WAS abducted by aliens, or she is really from an alternate universe, and just went back. And is trying to come back for bot, to show him her universe, or something like that. cool theory, HitD – we’ll find out exactly what’s going on with cel before this storyline ends! I kind of always figured you were the mirrored Jeffbot in our universe. i think that’s a good assumption, TPC, though i can neither confirm nor deny this. Parallell universes sound so cool, I cant be the only one who thinks that. As a SciFi/Fantasy geek, I love coming up with stories of my own featuring parallel universes. yeah, parallel universes sparked my imagination as a kid, DAS. (and obviously still do.) sometimes i think about all the parallel universes created had my decisions gone different ways. Infinite parallel universes gives rise to Infinite possibilities. The question i would like to know is this: which is Earth Prime? Bot’s world, our world, or none of the above? you’re right, it’s not ours, Maryz, so: none of the above. Sooo… which Cave Bunny is from Jefbots Universe? I have a feeling its not the host, but the fluffy. What makes Upgraded Musashi…. i’m happy you pondered this, Maryz. and, as the Magic 8 Ball might say to your question: Outlook good. all things are possible, Insane Kitsune! maybe even more than one, Blunz! Parallel universes? Rut Roh Raggy. ooh, Daleks and Cybermen!? that could be bad, dj! let’s hope bot’s careful with his dimension-jumping. Can we do a side trip to the universe where teachers and librarians are paid more than professional athletes and you need a psych eval to enter politics? I want to take photos. There are so many things that I didn’t comment on initially that I don’t want to let go without mentioning. First, I hope the thing that has been keeping you busy is an acting gig! 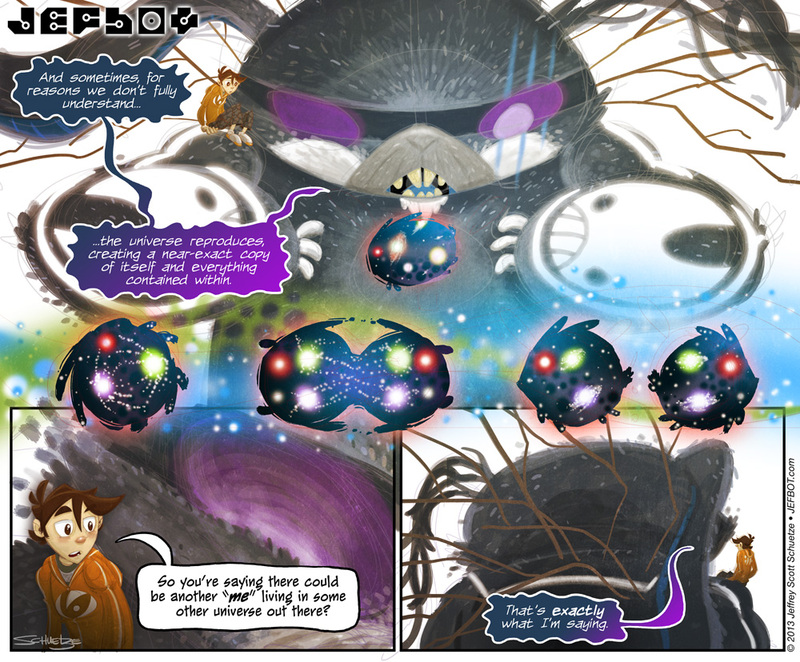 Also, I love that rather than the universes being platypi (platypuses?) they are rabbits. 🙂 And I love that when the universe splits it looks like cellular fission. Cool! i wish i could say it was an acting gig, Shanna, but alas, no, nothing quite that exciting! mostly JEFbot stuff and keeping-my-head-above-water stuff. Holy duplicate! You mean there’s another one of me out there? That’s not good for anyone. at least another one of you out there, PJ Day! there could be infinite “yous” in other, infinite, universes!